A textile fiber – not fiber optic or dietary. A textile fiber has a high length to width ratio and is relatively fine and flexible. 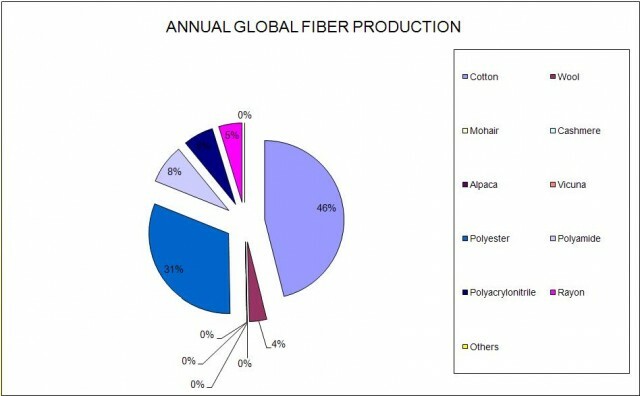 There is a Global Market For Fibers. This gives textile fibers some very unique and valuable properties. Polymers are large molecules that possess a chain like character. These chains consist of repeating groups of atoms that are covalently bonded to one another. The word polymer comes from the Greek in which poly means many and meros means part. Polyester is a polymer with a relatively simple repeat unit – your DNA is an example of a polymer with a very complex repeat unit. Lets look at some molecular models of polymers. We take a collection of mers and take them from an unreactive to reactive state often by use of heat, pressure, and a catalyst. 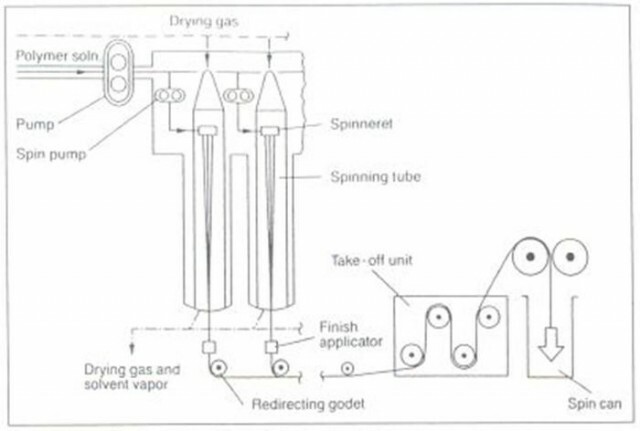 Via this technique we can take ethylene gas and turn it into polyethylene plastic, for example. As we change the elements composing the mer molecule, we also change the attributes of the final fiber extruded. Hydrogen is white, carbon is black. Both double and single bonds are present. 9 g/d tenacity and 18% elongation at break for polypropylene vs. 3 g/d tenacity and 40% elongation at break for conventional polyethylene. Polypropylene can be made in 6 different isomers only one of which – head to tail isotactic is used in commerce to form fibers. Polyethylene is tougher than polypropylene rather like some nylons are tougher than some polyesters. 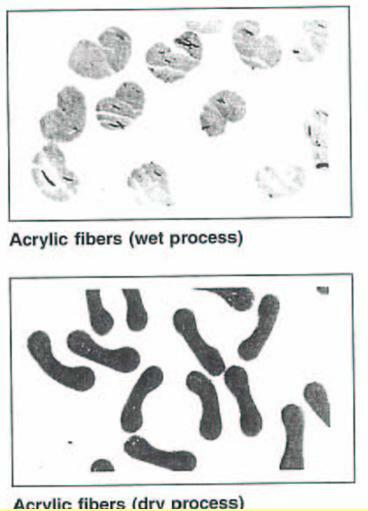 Neither of these fiber types dye well as they are bereft of dye sites. They are both in the olefin generic class. Both carry the same generic name: olefin. Provides a solid foundation for understanding how fibers behave. How they burn and react to heat. Wallace Carothers is credited with the invention of synthetic rubber and nylon around 1933 at Dupont. 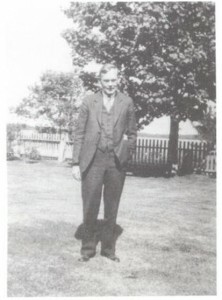 Fiber went commercial around 1938 and is still used extensively today. Dupont recouped all investment in nylon 6,6 within 30 days of plant startup as there had been nothing like it before. Due to the way in which polymer chains group themselves together in a fiber, fibers are endowed with unique characteristics in-between those of brittle plastics and rubber elastics. In a fiber we have a two phase system: Crystals contribute strength and amorphous regions give stretch. All other things being equal as we increase polymer chain length so we increase fiber strength. Typical polymer repeat length in the tens of thousands. Typical polymer repeat length in the thousands. By adding various atoms or molecules along the polymer backbone, be it all carbon or otherwise we can radically effect fiber properties. We can add dye sites to impart specific dye affinity for example cationic and dyeable polyester. We can add flame resistance as seen in Treviera CS and similar fibers. If we take a carbon carbon backbone like we have in the olefins and add a particular pendant nitrogen containing group – what fiber do we end up with? 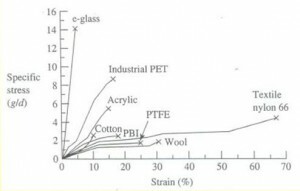 Atactic polyacrylonitrile – the core constituent of acrylic fiber. Note that this fiber is copolymerised with other polymers like vinyl acetate and vinyl chloride – if over 15% by weight of copolymer then according to the FTC we have a modacrylic fiber. 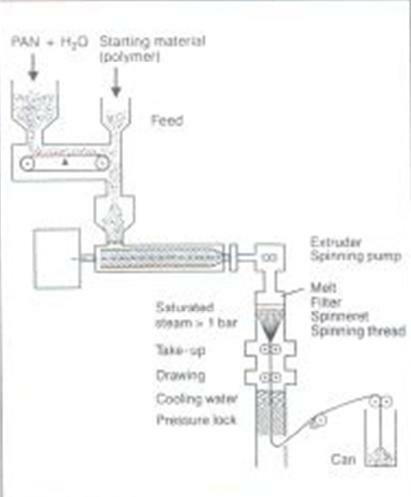 The softening and melting behavior of textile fibers is a direct result of the way in which the polymer chains are interconnected. If the polymerchains are free to move when heated then they will soften and melt. If applied heat breaks up the chains before they are free to move then the fiber merely chars when heated rather than melting. In general those fibers which soften and melt can be heatset . This process is an extremely valuable finishing technique that can impart very high dimensional stability to fabrics so treated. Let’s compare the force elongation or strength characteristics of the various classes of textile fibers. What is the fiber’s ability to recover from repeated cyclic stress? 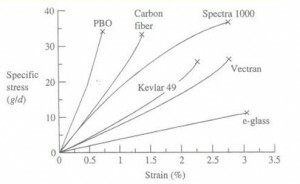 What is the fiber’s stress strain curve in solvents and in water? What is the relationship between toughness and tensile strength with respect to the force elongation curve? Our units of toughness (the area under the force elongation curve): joules or energy to break. Bending stiffness is proportional to diameter to the fourth power. So if we increase the diameter of a fiber threefold the bending stiffness increases 34 = 81 times. 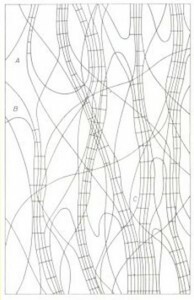 This is the reason why multi-strand copper wire is so much more flexible than single strand wire of the same thickness. Microdenier fibers produce yarns and fabrics that are very soft due to the reduced bending stiffness explained by our bending stiffness-diameter rule. Microdenier fibers require more dye per unit weight than do thicker fibers to achieve the same depth of shade, a phenomenon explained by the large additional surface area that must be dyed to a given color depth. Specialty synthetic fibers are rather like specialty animal fibers. There are quite a few of them but not a huge amount of poundage is produced in any of them. They serve some very important end uses such as body armor. There are many of these, with special characteristics such as anti bacterial performance, high or low wicking, UV resistance flame resistance, and high strength. The extrusion system can effect characteristics like fiber cross section. Vinyon polymer is a co-polymer of vinyl chloride and vinyl acetate. We dissolved the polymer chains into acetone and then wet spin into a water bath. 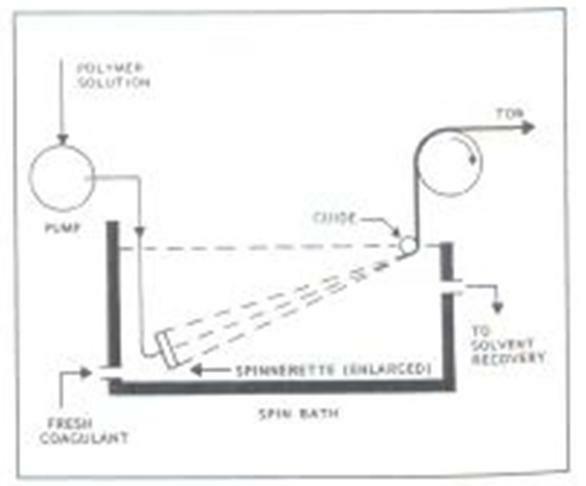 We draw the extrudate onto a take up roll (further drawing is possible). The chlorine present in this fiber give it good flame resistance characteristics. The acetyl groups of the vinyl acetate monomer of this fiber and the principle of “like dissolves like” explains solubility in acetone. There are two types of methods. Qualitative – What type of fiber is it? What is the correct generic class for the fiber? Quantitative – How much of a given (typically generic) fiber type is present. Qualitative analysis is covered by AATCC TM 20 (See AATCC Technical Manual). Quantitative is covered by AATCC TM 20A (See AATCC Technical Manual).